You’ve likely seen the headlines: “Seven out of eight employees are disengaged and unlikely to be making positive contributions to the workplace.” Picking up a business magazine, sorting through social media posts, or attending Human Resources conferences, one can’t help but leave feeling discouraged or hopeless by statistics like these. If 88% of my workforce is disengaged and not doing me any good, why not sack the seven and get the work done by the one at a much lower cost? Scary thought! Is it based on correct principles and solid research? The truth is, not really. Let’s look at it with some common sense. Even with more the conservative numbers claimed by some, this level of disengagement would spell disaster for any firm. When it comes to employee engagement, it’s often difficult to sort fact from fiction. So, let’s look at some workforce engagement myths that commonly bombard us. As we completed the research for our recently-released book, The Employee Experience, we reviewed our results from over 24 million survey responses. What we learned was that the fully disengaged figure across the world is actually less than 5% –– a far cry from the staggering numbers reported in HR publications today. So, why does this myth have wide-spread distribution? Because there is some truth to it. However, this one is more myth than truth. The myth? 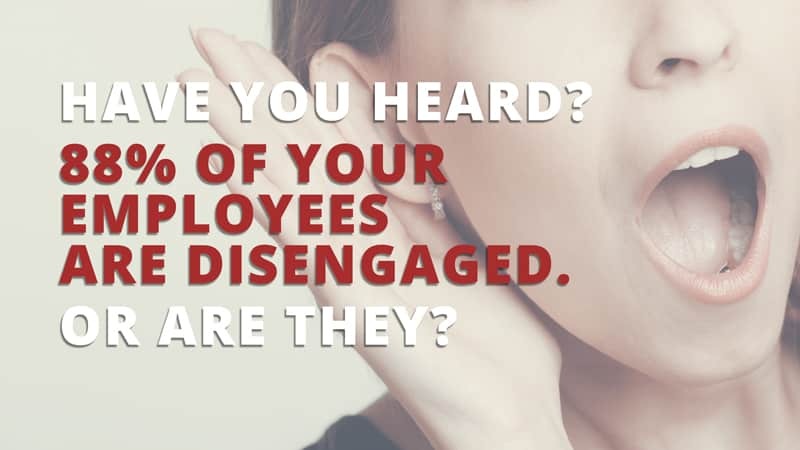 Most are your employees are disengaged. Actually, it’s only a small percent that fit into this category. The truth? Our research found that 32% of employees globally are fully engaged (the “enthusiastic champions”), 48% are key contributors (the “strong and steady”), and 16% are in the opportunity group (“fence sitters” or “waiting to engage”). This means that 20% of employees are either disengaged (4%) or are situationally engaged (the 16% that may or may not be engaged, depending on the situation or moment). 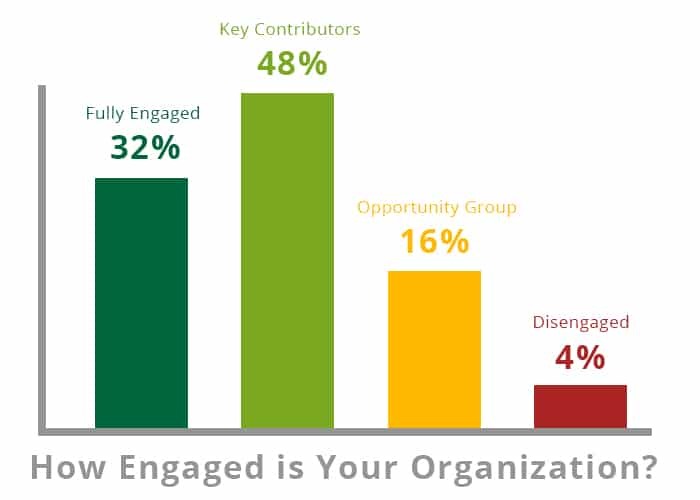 The message here is not only beware of scary figures, also how do you know what engagement levels are like within your organization? That said, engagement should clearly be an ongoing concern for any organization and priority should be given to measure engagement and improve upon it. In a day of workplace foosball tables, free dry cleaning, t-shirts, and other swag, it appears that many organizations today are trying to compete by out-perking the hiring competition. While some of these may create a satisfying workplace, they are generally short-lived. The value only goes so far. We call this the “Adaptation Principle.” Psychological research says that when someone jumps to a higher level of income or a new standard of living, they quickly adapt and become dissatisfied again. If you try to buy employee satisfaction by upgrading perks and hygiene factors, the price always goes up. Give employees a bonus, and that becomes part of next year’s expectation. Taco Tuesdays? Great! But the company down the street also gets Fajita Fridays. That’s not greed; it’s human nature. Employee engagement is more than just perks and benefits. It’s about employees putting their hearts, hands, minds, and spirits into the work they perform. It’s about an organization working together to be top performers and drive results. Measuring engagement is similar to measuring one’s blood pressure. It’s important, as it is a key measuring in understanding overall health. However, in itself, it doesn’t create health. Now, imagine discovering you have high blood pressure. Each year you return to the doctor, only to be told, once again, that you have high blood pressure. You have several choices. First, you can go to another doctor, hoping that he has a blood pressure cuff that will give you better news. Not likely. Second, you can simply say, “Having my blood pressure checked isn’t giving me the results I need, so I’m not going to have it checked anymore.” That’s an ostrich-in-the sand approach, and could be dangerous. Finally, you could work with your doctor to address those areas that will improve not only your blood pressure, but your overall health. Perhaps it means more exercise. Maybe it’s a low-sodium diet. Relaxation or meditation may be on the list. Or, perhaps it’s medication. Regardless, proven interventions and ACTION improve health. The same goes for any organization. Measurement alone doesn’t cut it. An engagement survey is both a critical first and an ongoing step in engagement, as it is an effective measure of the organization’s health. Often, the simple fact that you are measuring tells employees you at least care; that may even move the engagement needle slightly. Moving to a new survey, or abandoning the measurement altogether is, quite often, just an excuse for not doing the heavy lifting. Until you start acting on the findings by creating action plans for change, engagement (and your blood pressure) will likely remain the same. Many confuse employee engagement with employee satisfaction. However, satisfaction is transactional and contractual. In return for their employees’ work, the organization promises to provide them with the basics: compensation, tools and resources, and physical and emotional safety, to name a few. We call this the “transactional contract.” Both the organization and the employee must continue to make constant deposits into the relationship “bank account,” and both sides continually monitor their account activity. For every withdrawal on either side, a deposit must be made. When there’s an imbalance on either side, a deposit must be made. Unlike employee satisfaction, engagement is not transactional. Employee engagement is an emotional state where we feel passionate, energetic, and committed to our work. In turn, we fully invest our best selves—our hearts, spirits, minds, and hands—in the work we do. Notice that “hearts” and “spirits” involve emotion or feeling. This is where happiness comes in. Happiness researcher, Shawn Achor, defines happiness as “the joy you feel moving towards your potential.” Happiness is a feeling. However, it leaves out the last two components of the engagement equation: “minds” and “hands.” These two components imply not only feeling, but doing or acting as well. It may be completely possible to find happy employees who aren’t engaged, and vice versa. Start measuring employee engagement today. Download a sample survey to learn more. Some managers and other individuals are stellar at creating situations where people naturally choose to be motivated. However, the key here is, choice. Like motivation, engagement involves choice. While a manager’s role is to create an environment where employees can choose to engage, ultimately it is the employee’s responsibility to choose to engage. Engagement is a 50/50 proposition. The organization owns 50% of the responsibility (to create the environment), and the employee owns 50% (to choose to engage). A small percentage of the population (we found this to be less than 10%) will choose to engage in nearly any environment. Conversely, a small percent (again, less than 10%) will rarely engage in most environments. The majority of us, however, are somewhere in the middle. We will engage in an environment where we can choose to engage. That environment is not the same for every individual. Remember, engagement is a choice. True engagement creates results. It involves both feeling and acting, as well as giving discretionary effort. This is what we refer to as “ENGAGEMENT MAGIC®.” In our research, we found that employees who found MAGIC in their work—the acronym for Meaning, Autonomy, Growth, Impact, and Connection—engage. Perks, surveys, and even happy employees don’t result in engagement. When the ENGAGEMENT MAGIC® keys are in place, however, employees will choose to engage.